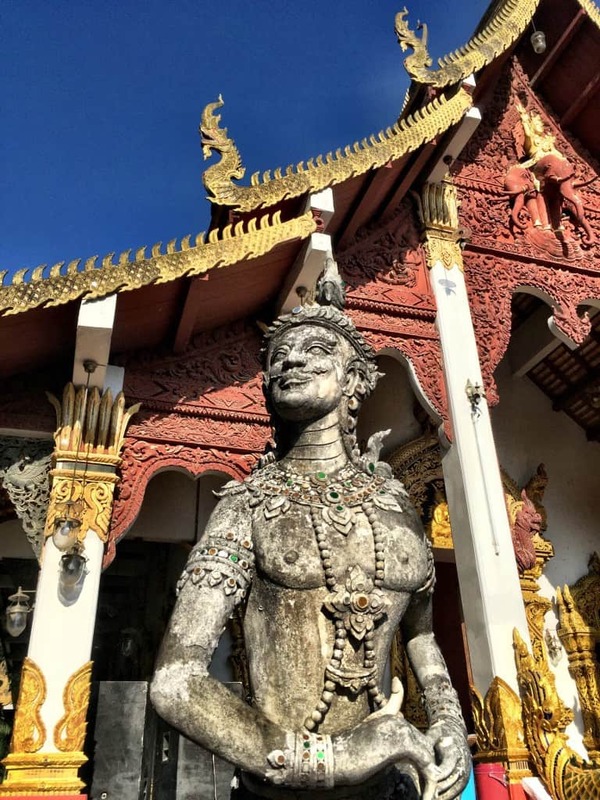 During our stay in Northern Thailand just outside Chiang Mai, we found a very satisfactory happiness in the peaceful “lost city” of Wiang Kum Kam. Having visited Isaan, Bangkok, the southern islands, and beach resorts, Northern Thailand was next. We were looking for a spot where there might not be as many Western expats. And so, the Universe delivered us to a place where Westerners are seen only briefly, if at all: the “lost city” of Wiang Kum Kam. Initially, we weren’t particularly keen on Chiang Mai. Thailand’s second largest city in the north is definitely inexpensive and more manageable in size than Bangkok. 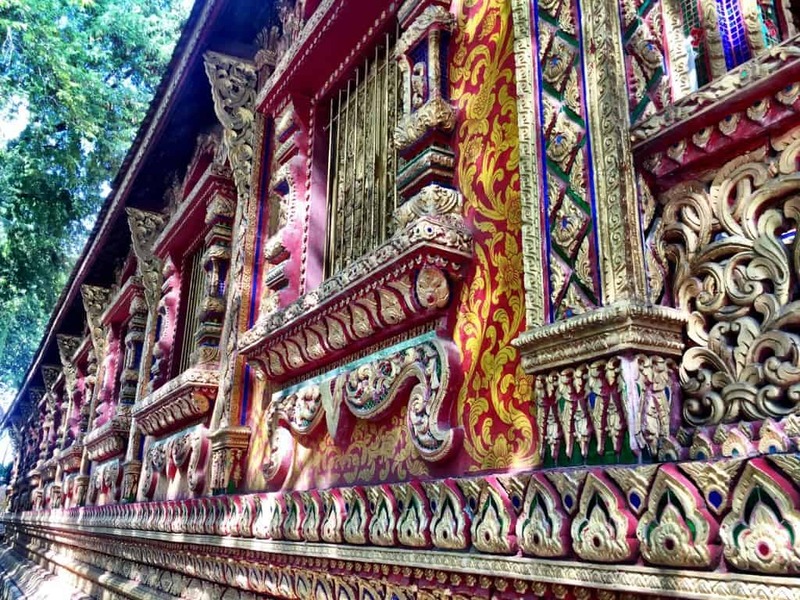 These aspects make Chiang Mai simultaneously a draw and a cliche with bloggers and other digital entrepreneurs. Holing up in CM for lengthy periods, they bootstrap online businesses using shared workplace arrangements, and if self-described accounts are to be believed, engage in extreme partying. We wanted no part of that scene. 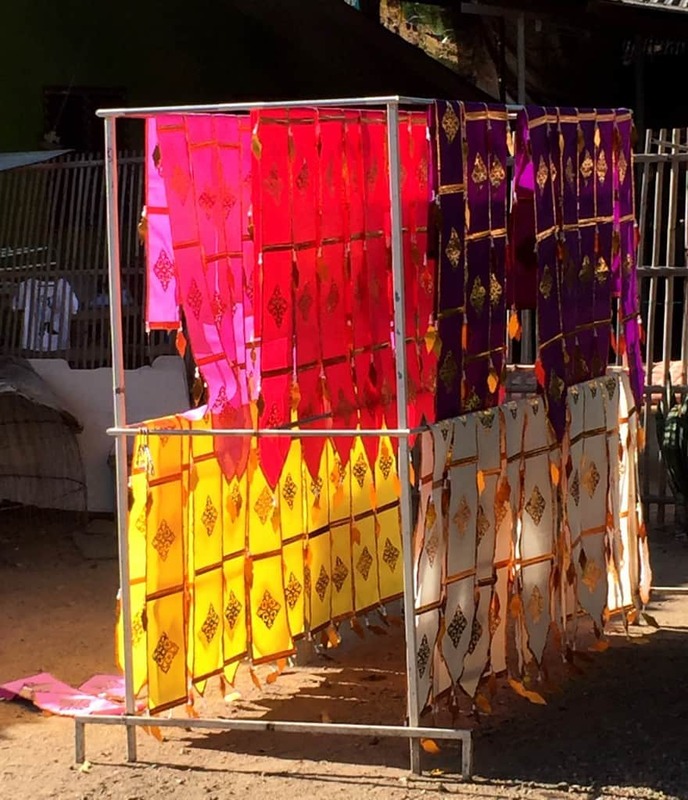 On the plus side, we were going to be in Chiang Mai for Loy Krathong, the Festival of Light, a world-renowned celebration which culminates in thousands of lanterns being released into the night sky. This was a happy accident, a bucket list item for many. The upshot: it was tough to find a hotel room in Chiang Mai during this crowded holiday. Then an option south of the city kept popping up. 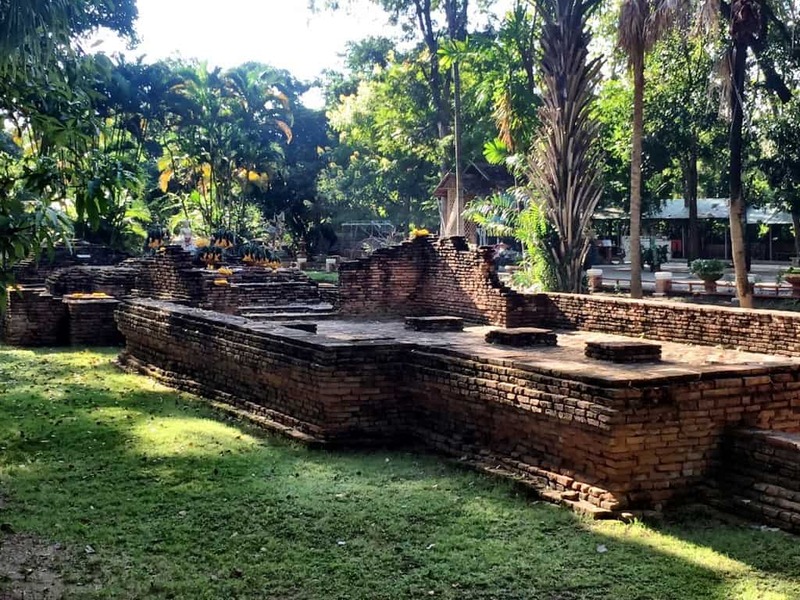 It was located in what was referred to as the “lost city” of Wiang Kum Kam. The more we heard about the lost city, the more we were intrigued. 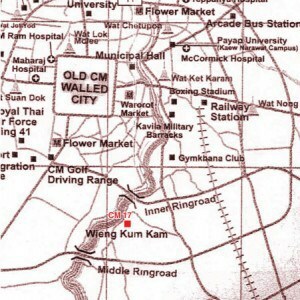 Wiang Kum Kam lies about 5 km south of the center of today’s Chiang Mai, between the Inner and Middle Ring Roads, across the River Ping. For almost 500 years, it had lain buried under silt from regular flooding, hidden by dense jungle vegetation. 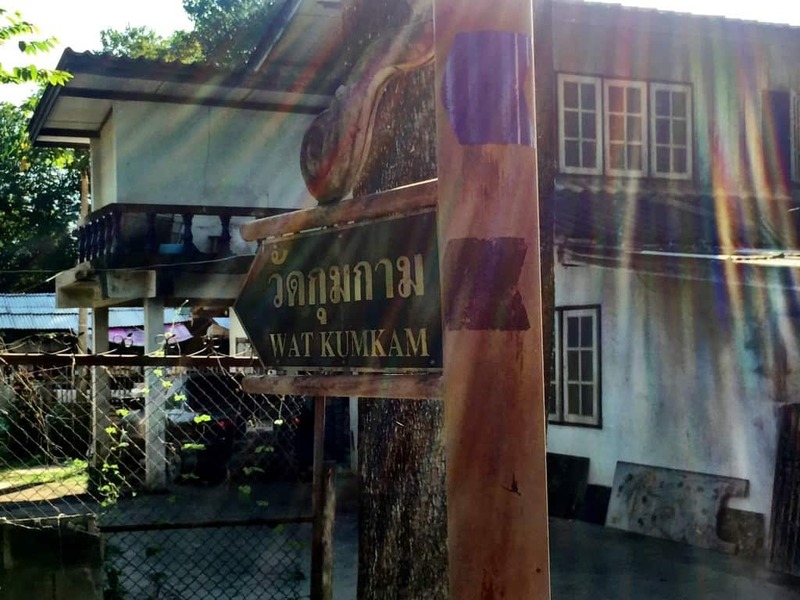 Even residents of the community formed around Wat Chang Kam, a temple constructed in the 19th century, didn’t realize their neighborhood held a city obscured. 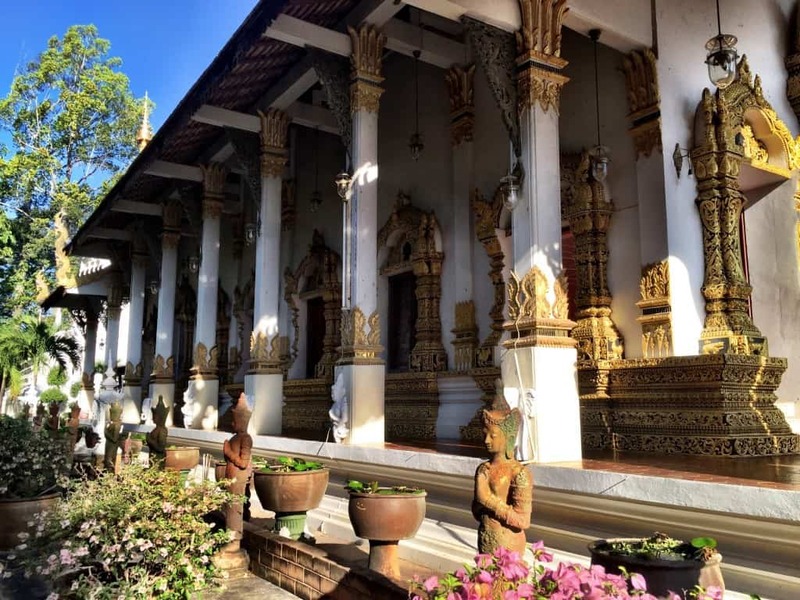 In the 10th century, this part of Thailand belonged to the Hariphunchai empire whose seat was located near the modern town of Lamphun. 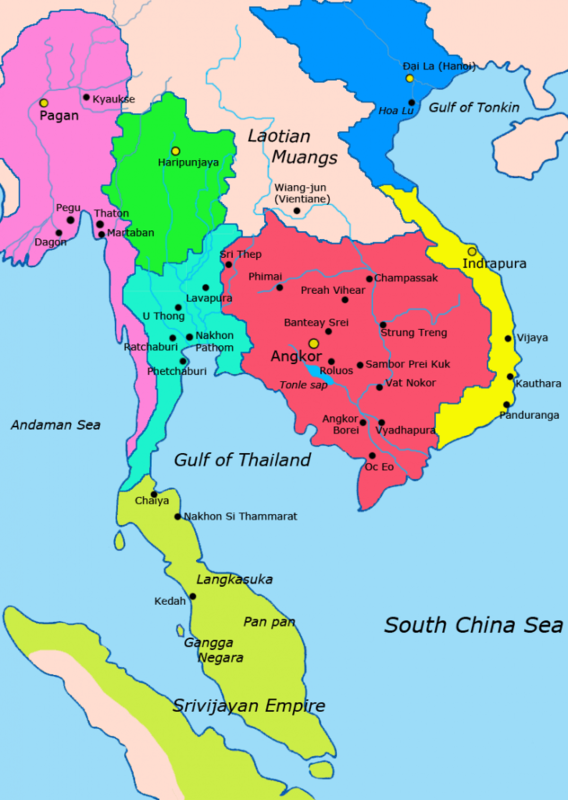 The Hariphunchai kingdom was conquered by Lanna King Mangrai who relocated the capital to Wiang Kum Kam, beginning its construction around 1294. Early on, this decision was ill-fated. The site was prone to regular flooding. 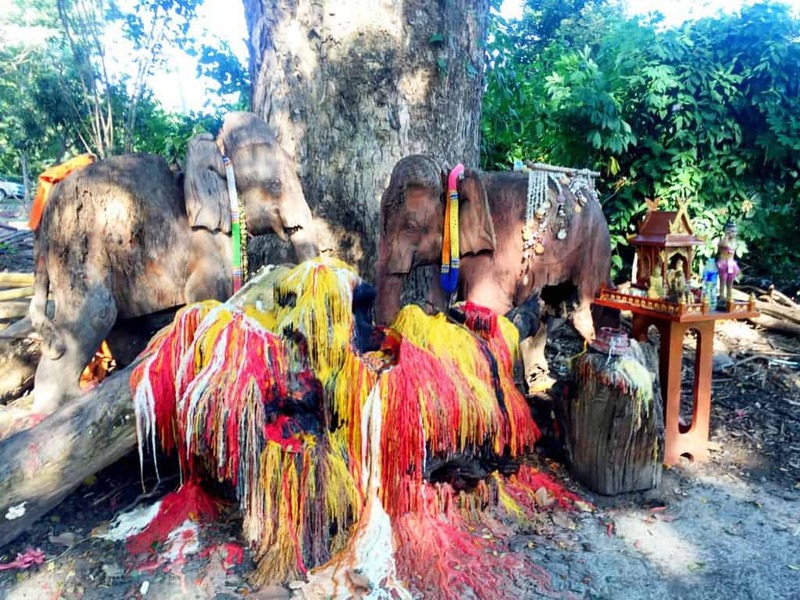 When a particularly severe flood changed the course of the Ping, Wiang Kum Kan, which had been located on one side of the river, found itself on the other. 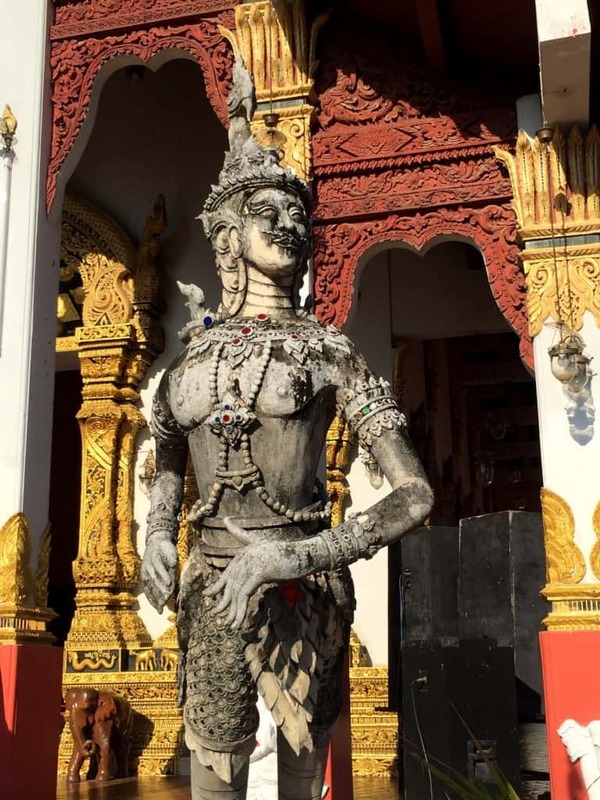 King Mangrai decided his capital would be better suited in what is now Chiang Mai. 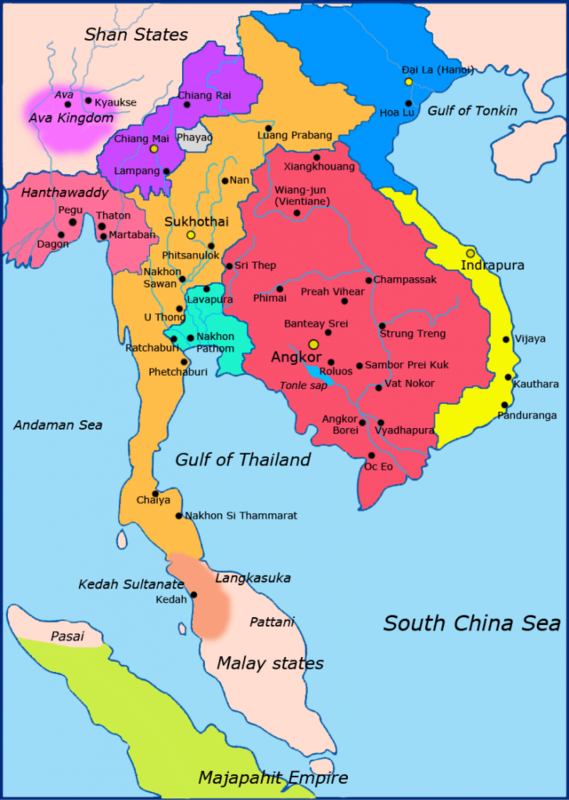 While Wiang Kum Kam still thrived throughout the Lanna years, it declined after the Burmese conquered Chiang Mai in 1558 and was subsequently abandoned. 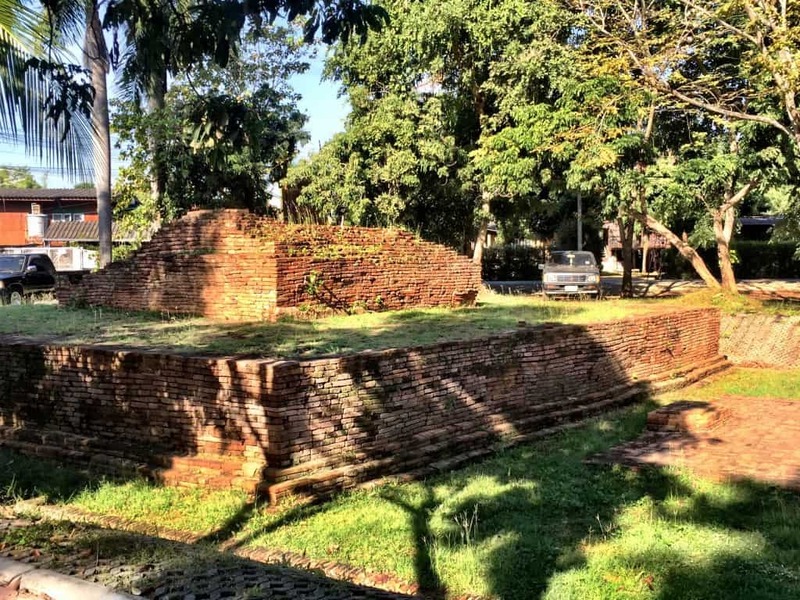 Rediscovered in 1984 when authorities were informed that ancient tablets had been found at Wat Chang Kam, Wiang Kum Kam was slowly uncovered. Archeological experts, working over the next decade within the ancient city’s walls, found over 30 separate historical sites. These discoveries included proof the area had been settled as far back as the 8th century. 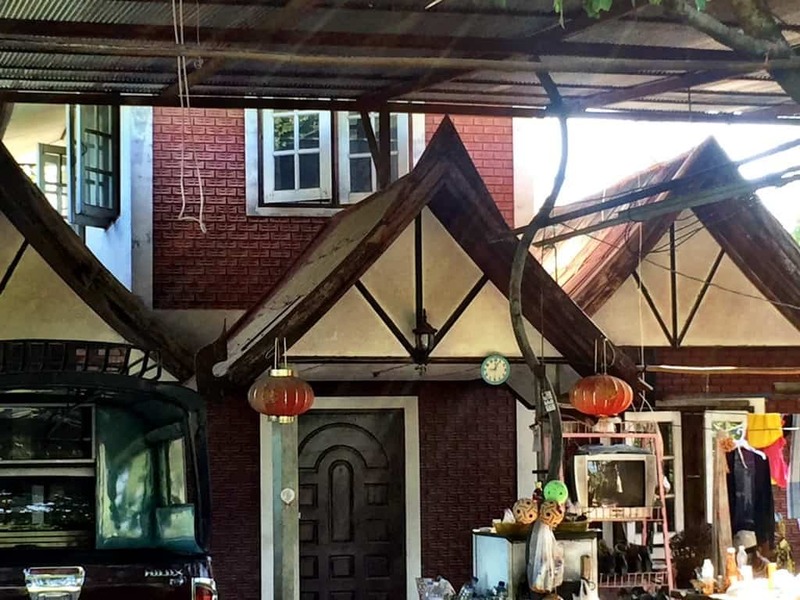 Today, the historic aspects of Wiang Kum Kam are juxtaposed within contemporary Chang Kam’s small businesses, restaurants and residences. It’s a quiet place, walled in at its perimeter for the most part, where you’re as likely to hear the clip-clop of a carriage horse as you are a motorbike. 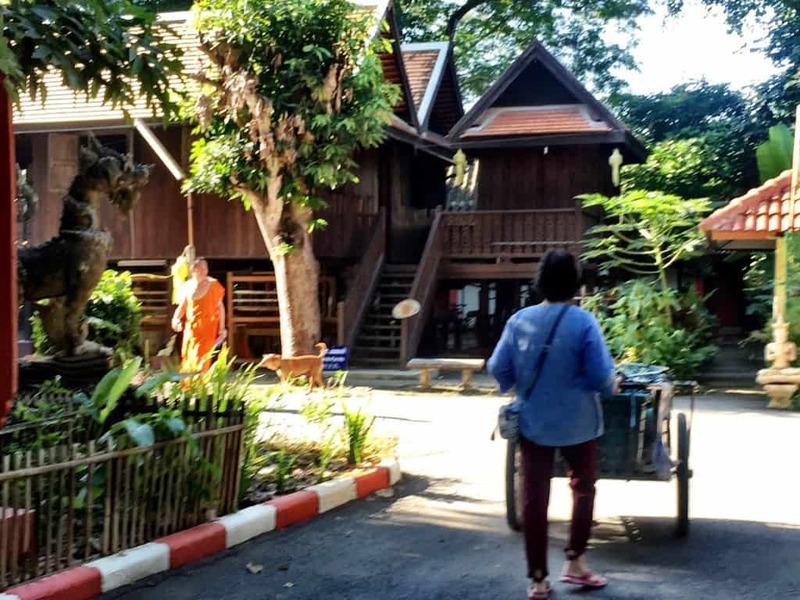 On the days we visited Chiang Mai for the Loy Krathong holiday celebrations, we were grateful to quickly return by tuk-tuk to a more leisurely pace. Escaping the chaos in favor of quiet tranquility takes only a few minutes. Staying put in a location allows us to catch up on work projects and factor in unscripted time. Several times during our stay, we explored Wiang Kum Kam using the hotel’s bicycles. 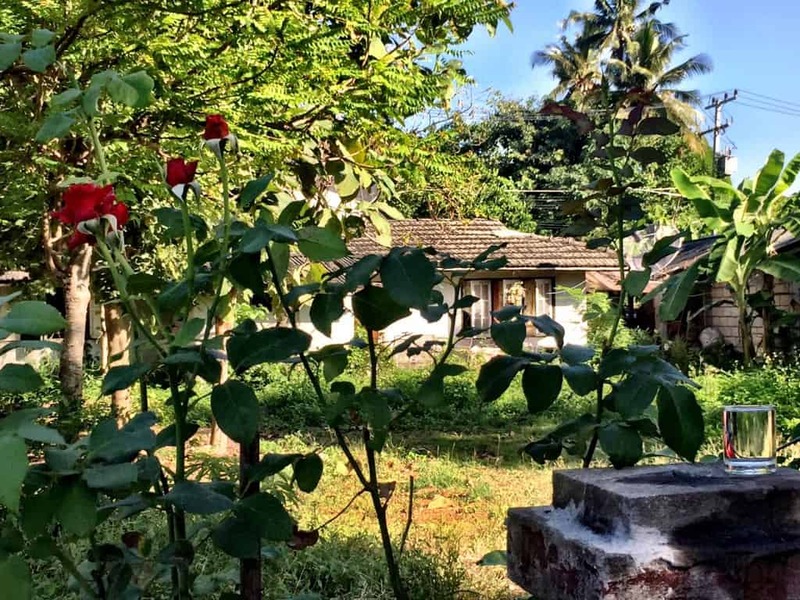 Daily life here occurs amid the vestiges of a rich religious history. Every few minutes on the bike yielded archeological treasure, ranging in size from low brick foundations to fantastically preserved temple structures. We could quench our thirst with a dipper of cool water at vintage stations outside many a home, or even from a tiny glass left out in case a passerby might be in need. This is a cornerstone of traditional Lanna hospitality: kindness to neighbors and strangers alike. 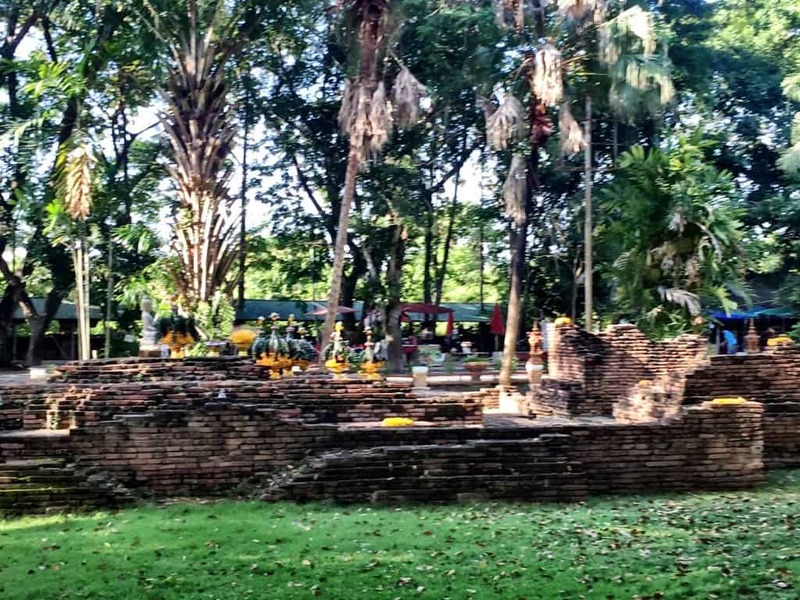 Wat Chedi Liam was built around 1287 during the Hariphunchai years, and was used during the early years of the Lanna empire. 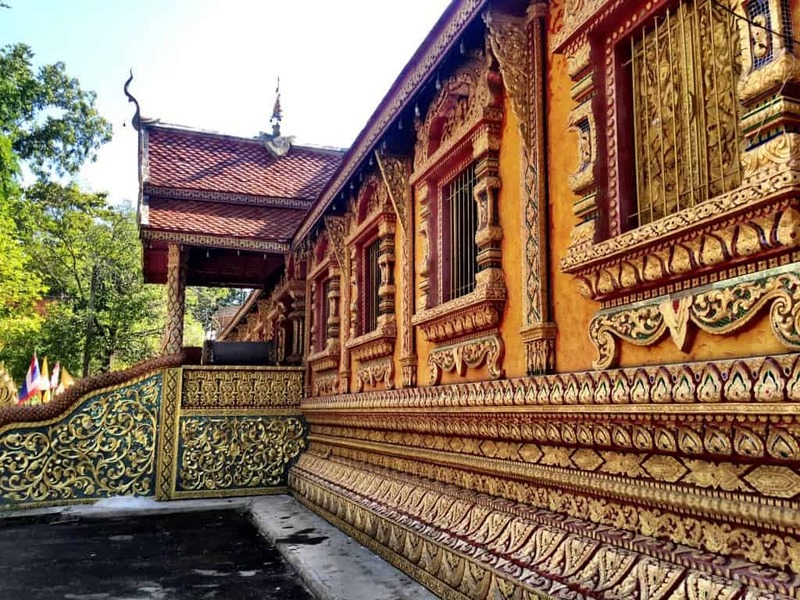 In 1908, the buildings were part of a renovation done by a Burmese trader, and reflect the Burmese style. 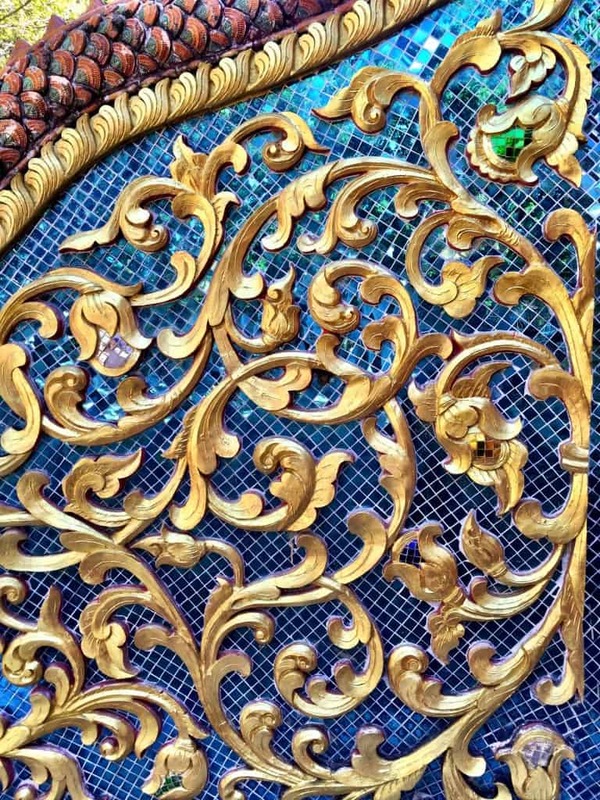 The artisans who adorned this temple worked with stunning devotion. The buildings literally glitter from thousands of mirrored squares and jewel-like adornments. Other renovations were made in 1992. This is a thriving temple with a weekend market and other activities. Wat Chang Kam, which means “elephants carrying” (also known as Wat Kan Thom after its builder) was built by King Mangrai around 1290. Other parts of the structure date to the 15th and 16th centuries. 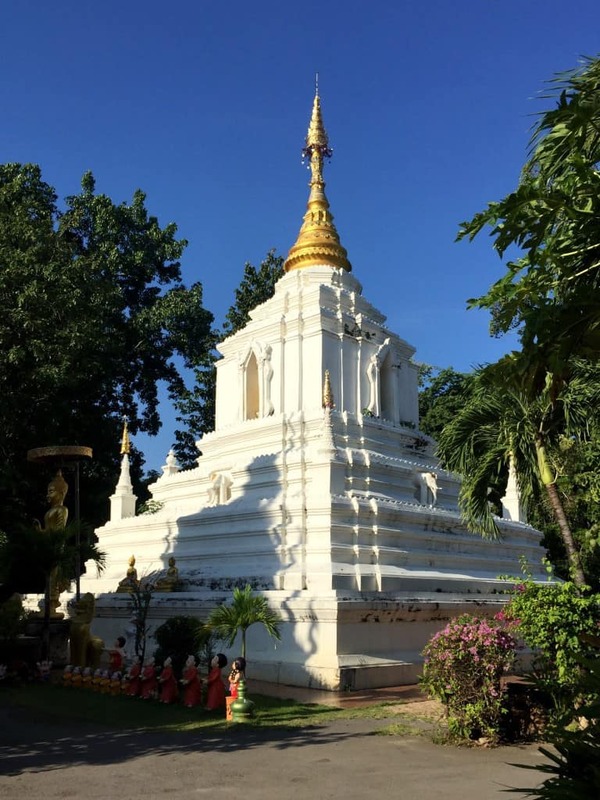 More modern buildings in the temple complex are believed to have been built by the same Burmese benefactor who built Wat Chedi Liam. 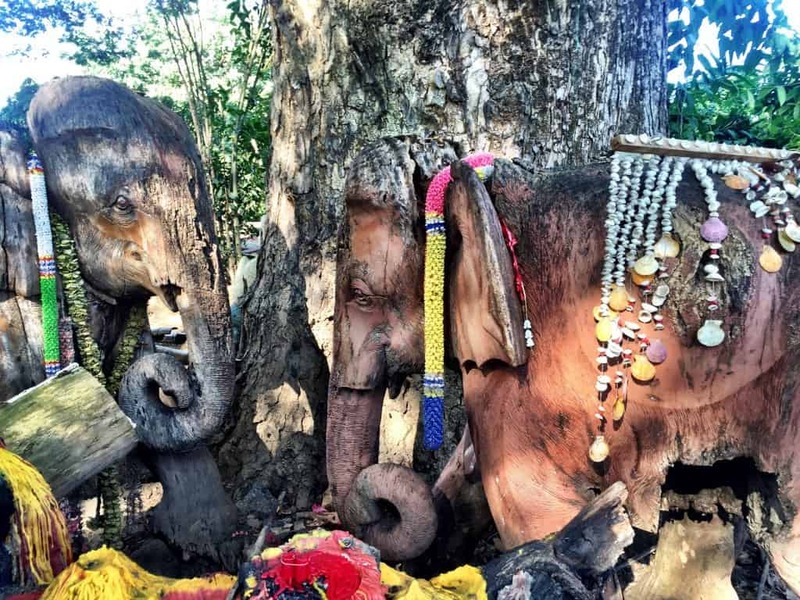 This temple features crouching elephants from which it derives its popular name. Sandstone plates were found here with three different alphabets dating between 1207 and 1397. This temple is located directly across from our hotel. 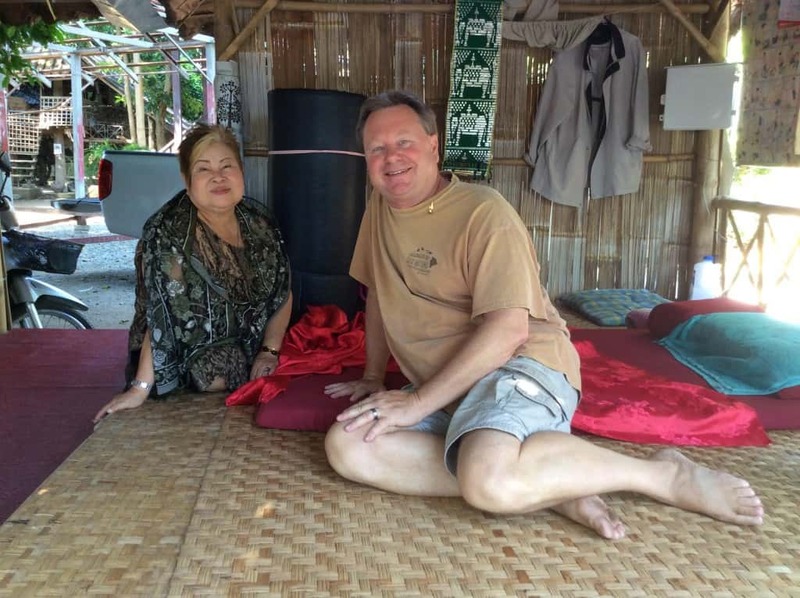 We received the best massage out of many in Thailand (and the most inexpensive – two hours for less than $10USD) here in Wiang Kum Kam, delivered on an elevated open-air platform by experienced ladies at Chang Kam temple. A tip: when you’re looking for Thai massage, you want a lady of a certain age to give it to you. Save the sweet young masseuses for folks who don’t know any better. These ladies are masters of their art. Proceeds go to the temple. We’d stop to eat at tiny mom and pop restaurants or food stalls outside the temple. 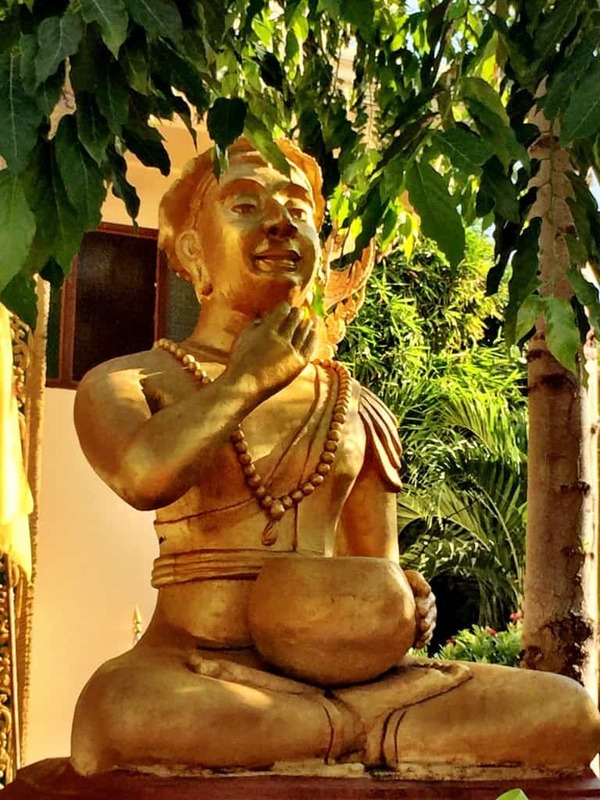 Each day, the outside world beyond Wiang Kum Kam receded. Disturbing news of war and global terror threats couldn’t penetrate its invisible barrier. Though there has not always been peace on this land, and though we were to find remnants of war and destruction not far away, this moment in time was calming and optimistic. Even bustling Chiang Mai seemed perceptually distant. 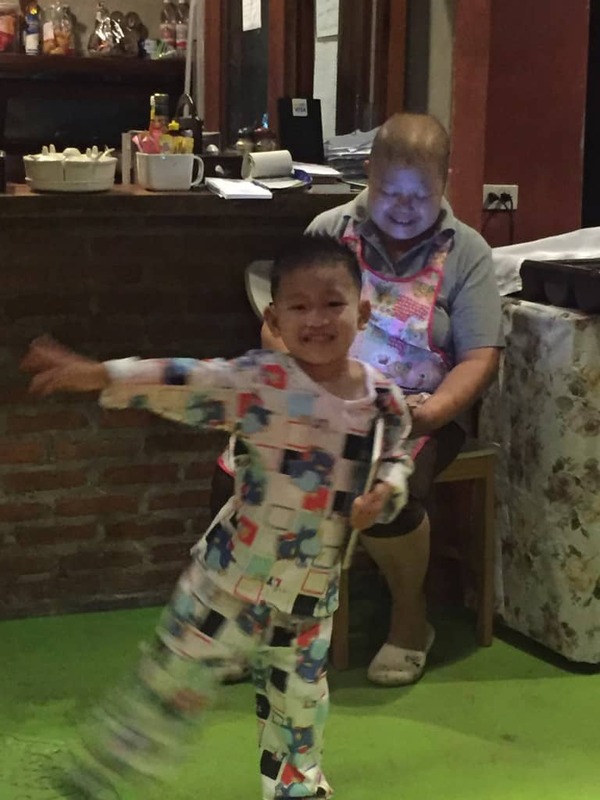 In the night before we closed our eyes in Wiang Kum Kam, we could happily think of waking the next morning and then drift asleep carefree. 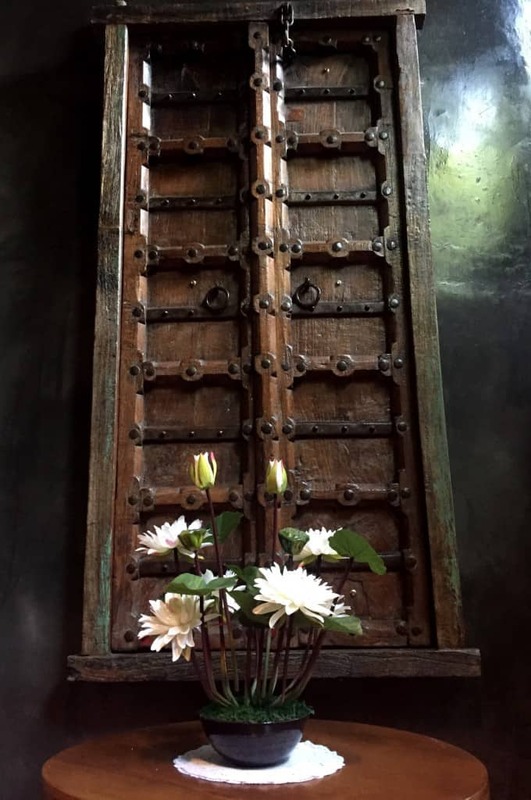 In the morning roosters would crow, light would filter through the balcony’s bamboo screen, and the monks across the street would chant, their incense wafting, bathing everything in sacred fragrance. We felt part of this different world of temple ruins and simple living, knowing the day would arrive and begin exactly as it always did. The morning’s first coffee in our room would be accompanied by the sounds of breakfast preparations from the kitchen and happy chatter of the little boy downstairs. “Good morning!” he would call out in English whenever he saw us, no matter if it were noon or night. “Good morning!” meant he was leaving for school with his grandmother, chasing his puppy, or dancing before bed. And good morning it was, all day, every day. Our stay would go on to pass in a rhythm of serenity. This was a very satisfactory happiness. Stopping at the temple to deliver a gift of fruit on our last day in Thailand, we were beckoned by an oranged-robed monk to sit with him in prayer. Such a blessed honor, entirely unexpected, yet another signal, no matter that we couldn’t understand his intonations. 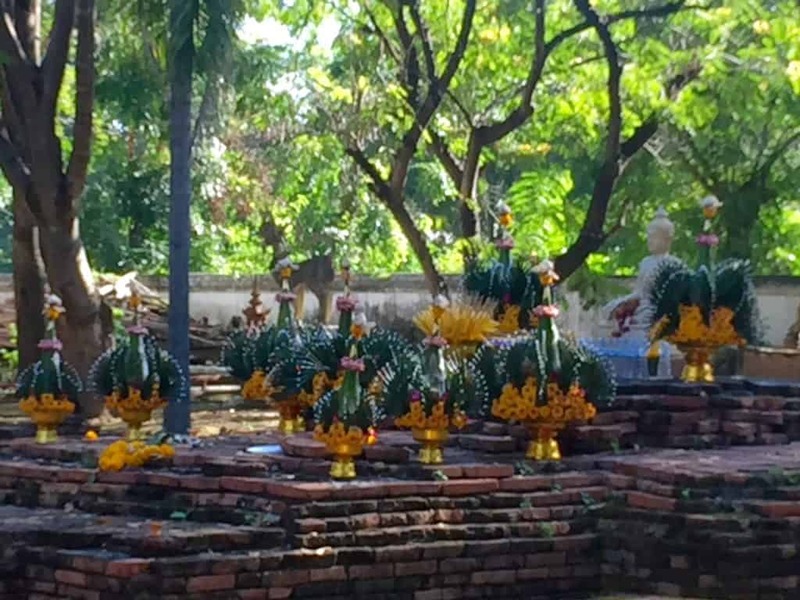 The lost city is very much alive in everyone who is fortunate to stay, no matter how long, in Wiang Kum Kam. 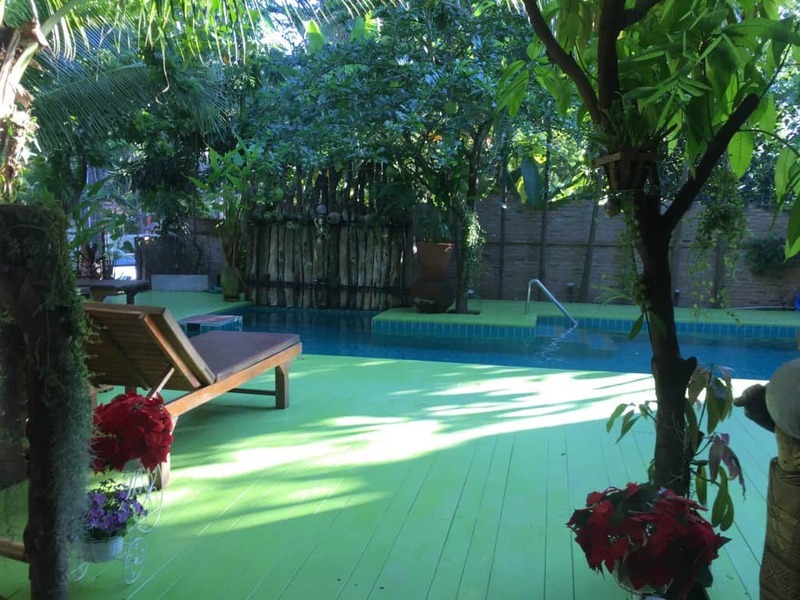 Tips and Information: Our headquarters, the hotel De Wiangkumkam, is a family-owned and operated boutique guesthouse with 9 air-conditioned rooms, each with their own balcony or patio. Prices are low by western standards, including breakfast and complimentary airport transfer. Free transportation is available into Chiang Mai at your request. Your tuk tuk back will cost about 100THB (a little over $3USD). The hotel can also arrange excursions to local attractions outside Chiang Mai via tuk tuk or other transport. 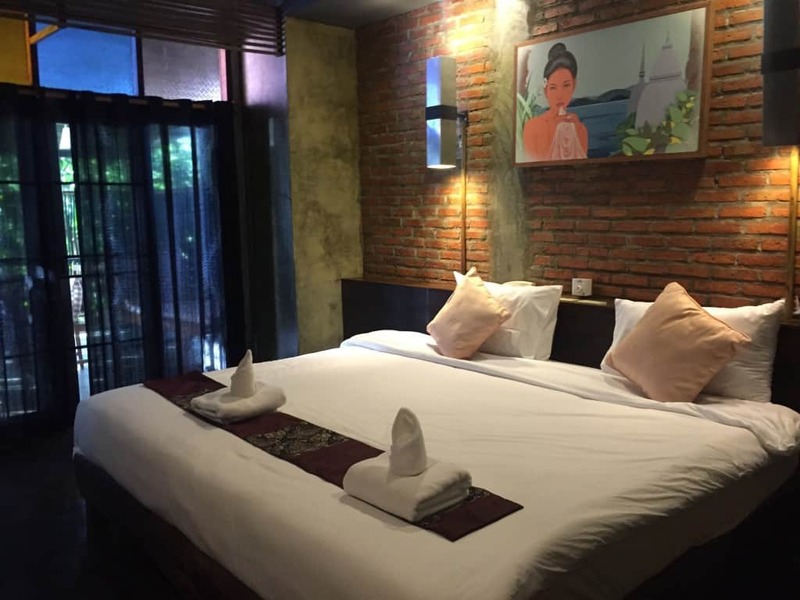 Find and read reviews of De Wiangkumkam hotel. 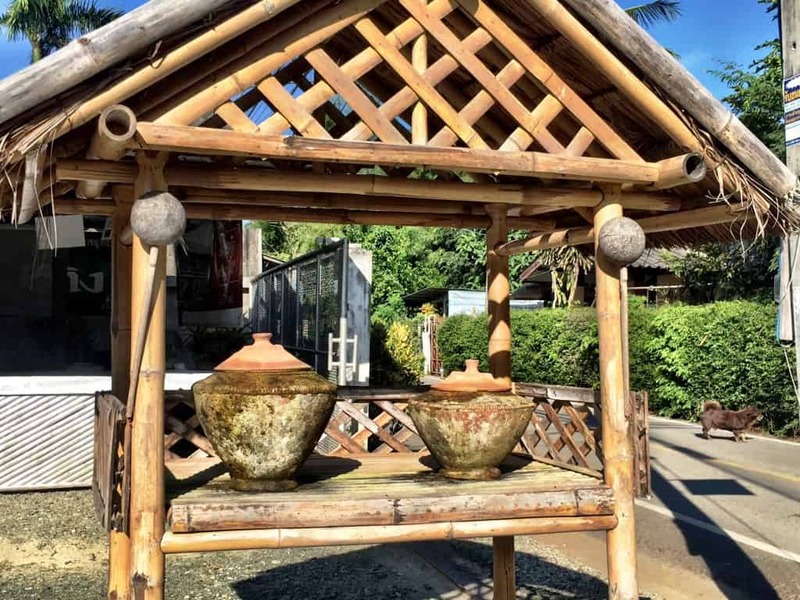 The hotel’s decor is eclectic with typical Northern Thai rustic elements, colorful accents, and comfortable spaces. Our deluxe upstairs room’s large, private balcony made a perfect place to set up shop. We were so comfortable here that we extended our stay by several days. De Wiangkumkam serves complimentary breakfast, Thai or Western style, in its onsite restaurant. Lunch and dinner are available, too. 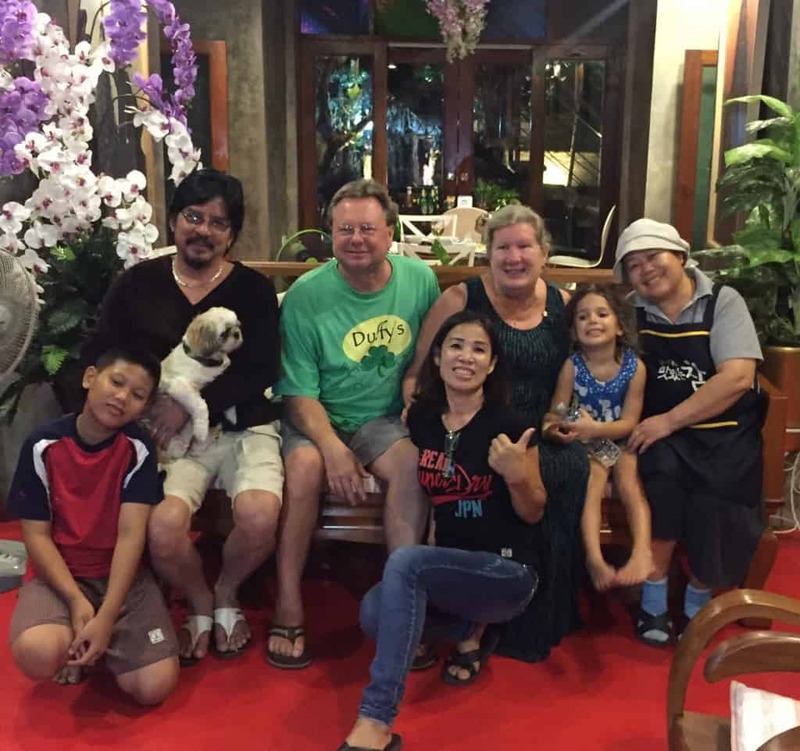 We were welcomed into the gregarious Thai family at De Wiangkumkam and might have even shed a tear at the lovely send-off they gave us. 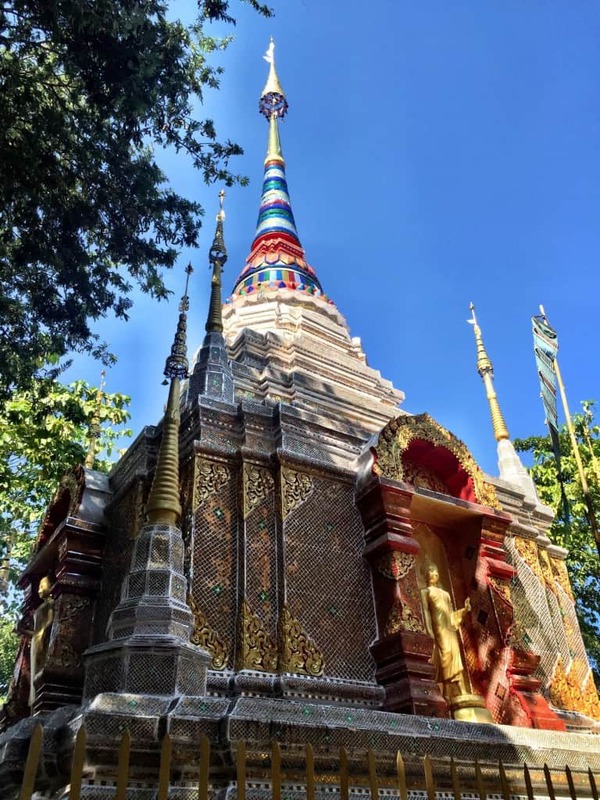 From the Wiang Kum Kam Information Center, Wat Chedi Liam or Wat Chang Kam, you may tour Wiang Kum Kam by horse-drawn carriage (200THB), tram (from 250THB per vehicle), or rent a bike for 20THB. The Museum at the Information Center has a 10THB admission fee. Disclosure: Our final dinner at De Wiangkumkam was compliments of the house. All other expenses were on our dime. Please note there are affiliate links in this post. Should you make a purchase or a booking using our link, we’ll earn a small commission which will not affect the price you pay. 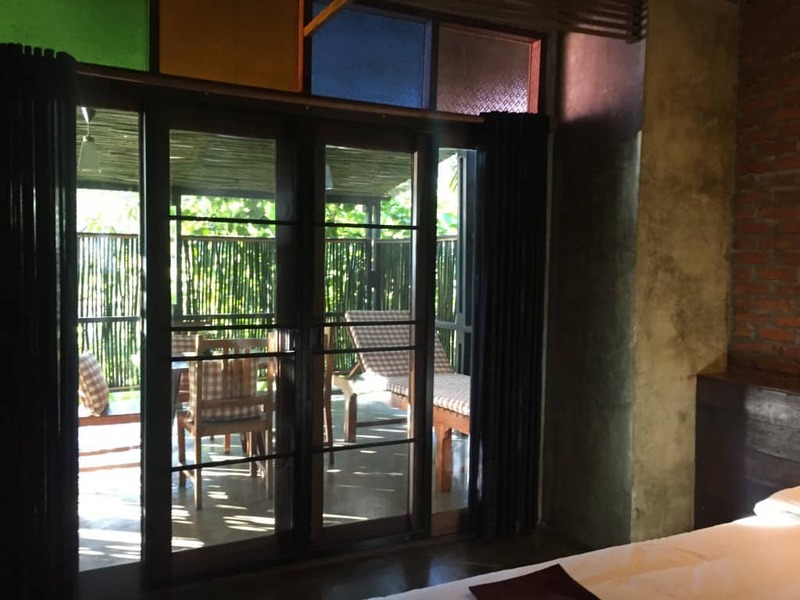 Wiang Kum Kam sounds like a perfect alternative to staying in Chiang Mai itself. I loved watching how your tuktuk driver kept passing on the left! Hi Rachel – My iPad camera malfunctioned during that tuk tuk ride and I failed to get the footage when she drove us in the right lane forcing oncoming traffic to swerve! Yes, we were relieved and laughed with her when she pulled into our hotel. I’d ride with her again! OK, I might rethink Thailand. I hadn’t been interested because I kept hearing Chiang Mai was for partiers. I love the area you stayed in and also LOVED two other things: the price of travel (hotels, massages!) and your hotel. Lovely! Hmmm…I may seriously think about Thailand now. Thanks for your post. I always enjoy the interesting background you share about the places you visit — and oh, those photos! 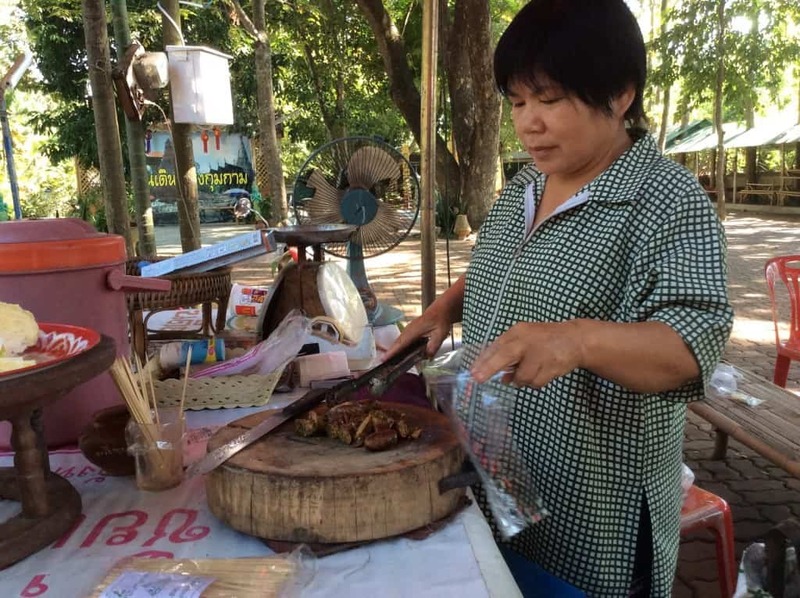 Wiang Kum Kam sounds like a real gem for an authentic experience. I’ve heard about the extensive blogger community in Chiang Mai and the partying scene from many sources. Sounds like a fun and wild time (forget my age), but if I ever get to Thailand, I’d like to see places like Wiang Kum Kam. 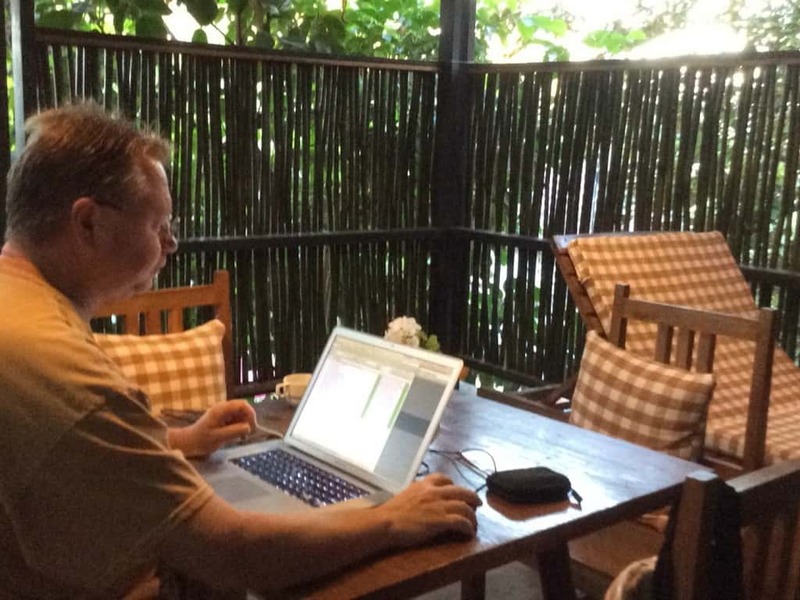 Hi Cathy – Yes, Chiang Mai could be a little too much for us. 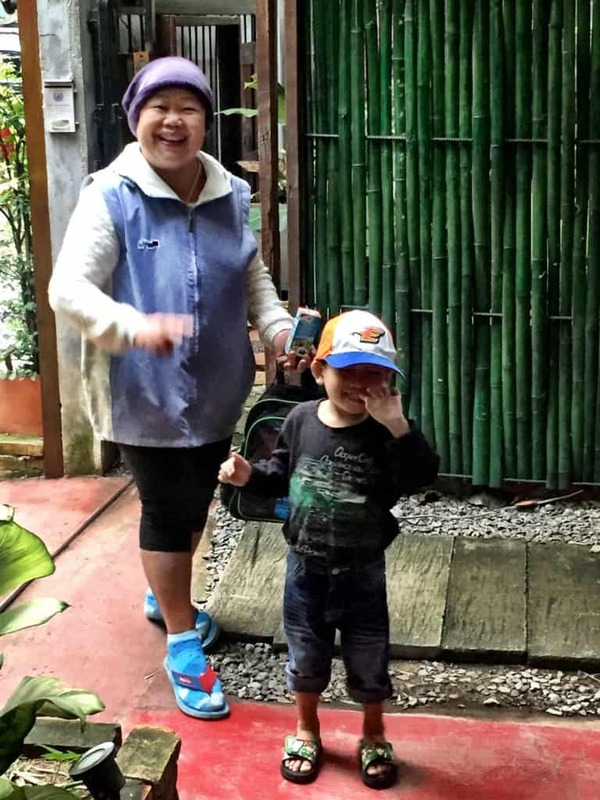 We are happy we chose to stay in Wiang Kum Kam instead. What a wonderful discovery, so different from the popular Thai destinations that you read about more often. I’d go there just for all those amazing buildings, but it looks as if the people are very welcoming too. David and I have never been especially interested in Thailand. The thought of Bangkok traffic gives us the shivers but Wiang Kum Kam sounds lovely. Maybe we have to re-think our ‘no travel to Thailand’ policy – lol. 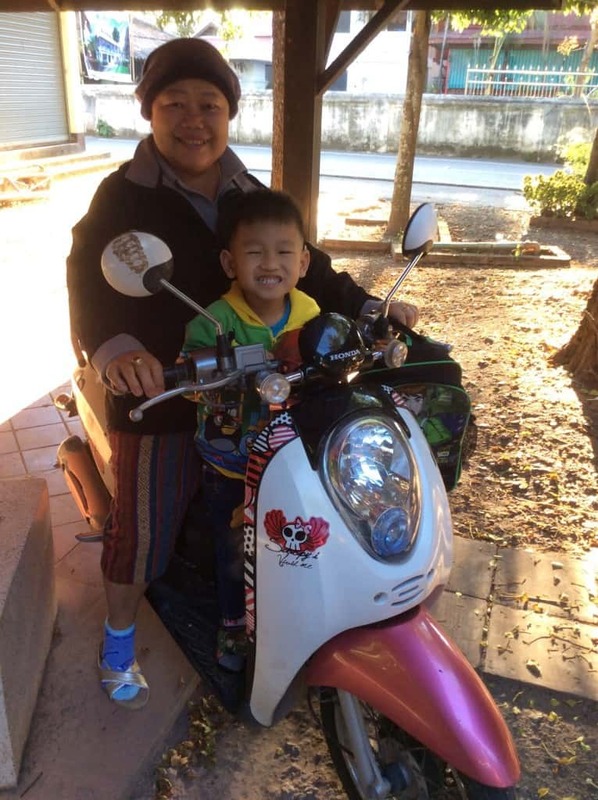 Hi Lyn – We thought Bangkok traffic was chaos until we went to Hanoi. We thought Hanoi traffic was chaos until we went to HCMC. 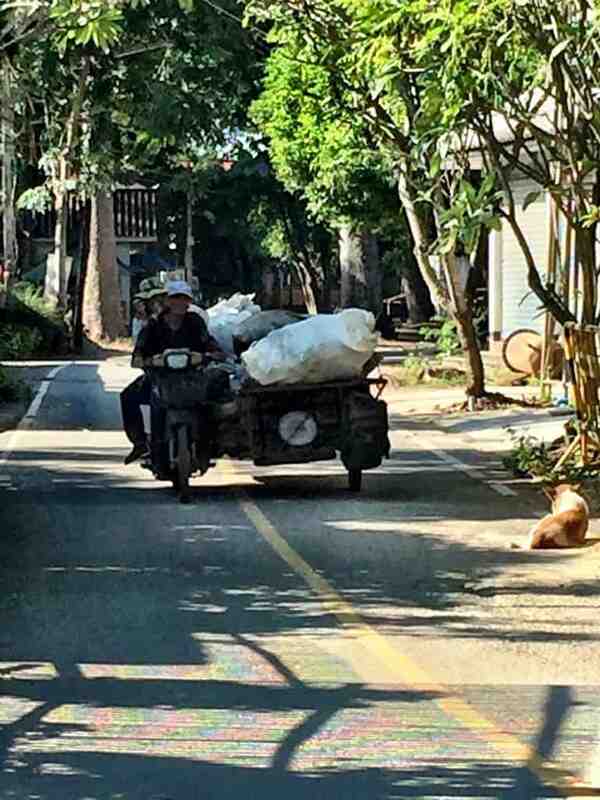 We thought Vietnam traffic was crazy until we came to China. 😀 It’s all relative. You’d love Northern Thailand, perhaps aside from Chiang Mai, I think. Didn’t realise there is a Festival of Light in CM? That would be magical to experience. 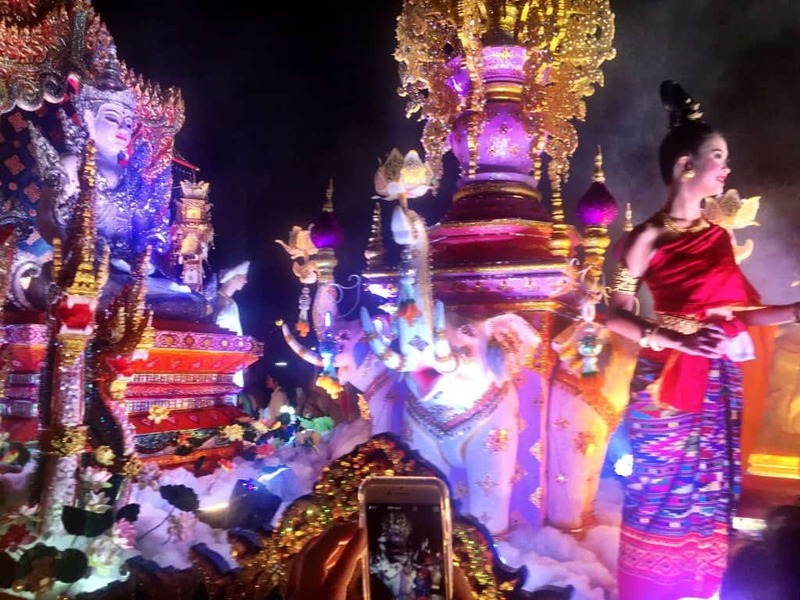 Hi Stefan – Yes, the Loy Krathong Festival Parade is a must-see. As well, releasing your lantern is their version of the floating basket ceremony in other parts of Thailand. It’s a beautiful and cleansing experience. 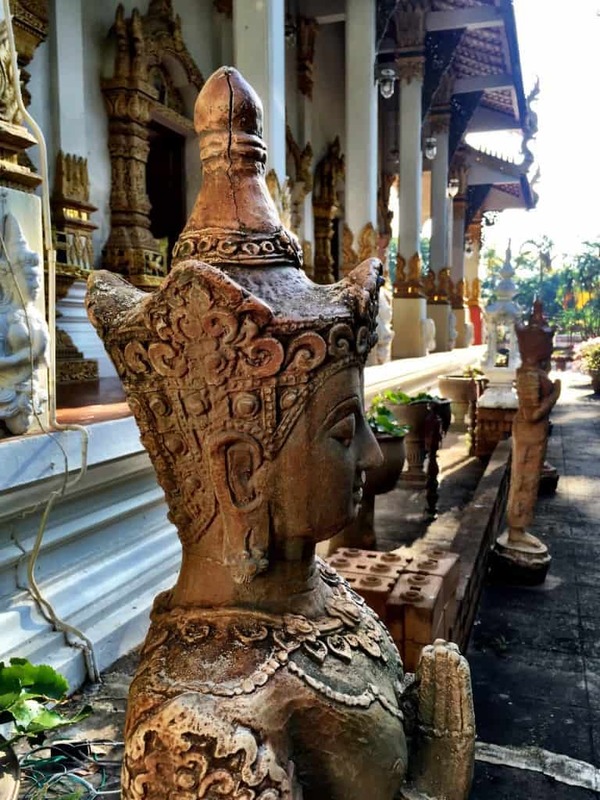 We visited Chiang Mai years ago, but would love to go back and visit Wiang Kum Kam now! I like all of your photos, they are all so colourful! 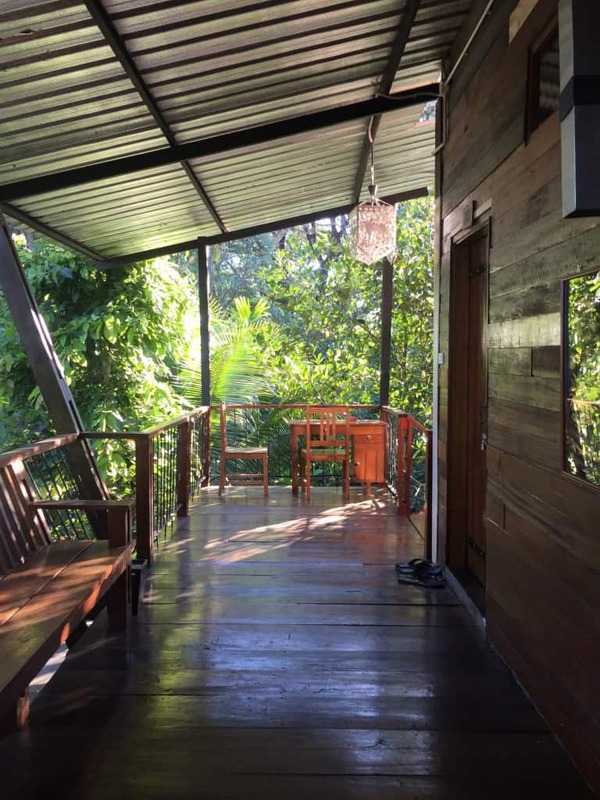 We’d definitely stay at the De Wiangkumkam – it’s so cheap, but looks like a great place! 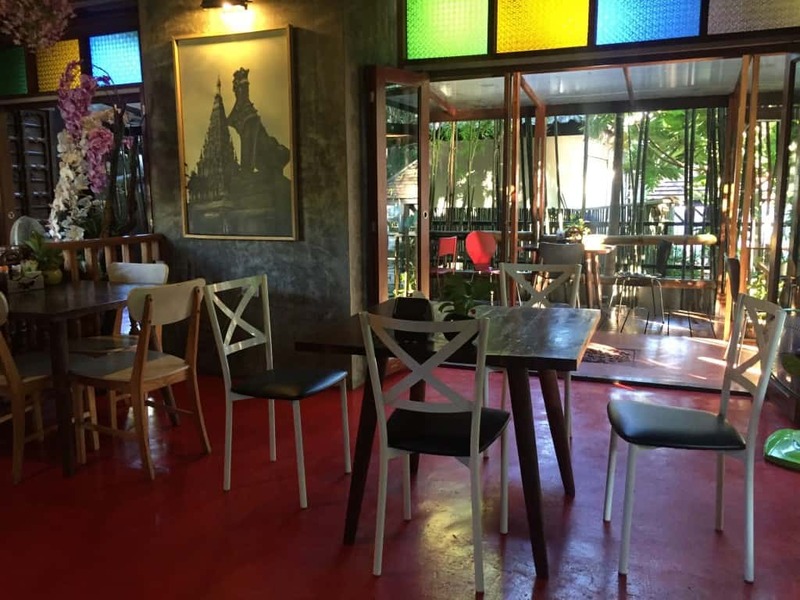 Hi Kim-Ling – It truly is a great option to get a less Westernized version of Chiang Mai. Nothing really beats a historical destination. You get to enjoy the view and the story behind each ruins. Hi Karla – We agree. History is so fascinating and there’s bunches of it here. This was so informativ really! Loved reading your article. Haven’t heard of Wiang Kum Kam before but it sounds so interesting. Hope to go to Thailand in the near future. 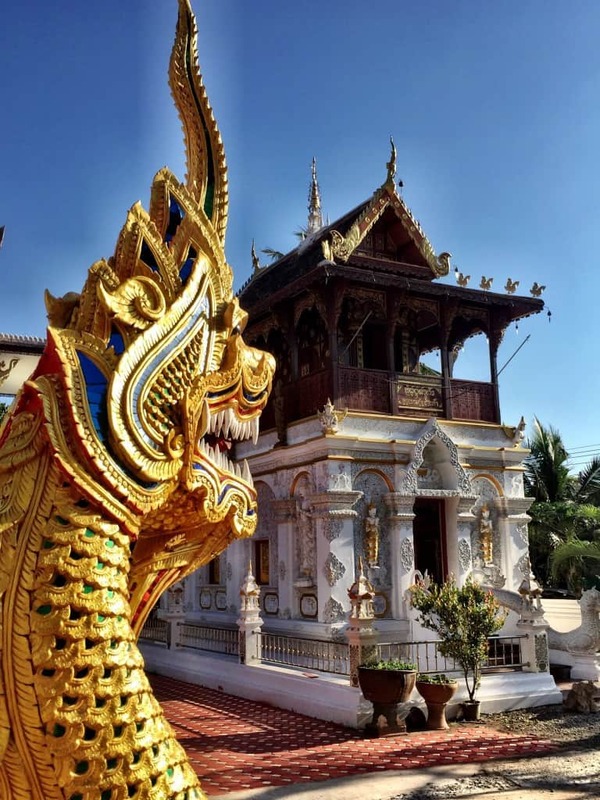 Hi Kathrin – When you do, make sure to check out Wiang Kum Kam! Thank you for the interesting history lesson! Great to hear about something other than Chiang Mai. Seems like a beautiful place to visit and with plenty of reasons to take out the camera. Hi Hugo – Glad you enjoyed it. Yes, many beautiful vantage points in this quite small area. What an incredible find in Wiang Kum Kam. I’m glad you were able to show us another side to the area, and I can’t wait to see the Festival of Lights photos. Definitely a bucket list item for me! Hi Alison – Yes, we were led to a place which was exactly what we look for. What a gorgeous area and hotel!! Looks like it definitely ended up being a great place to stay. 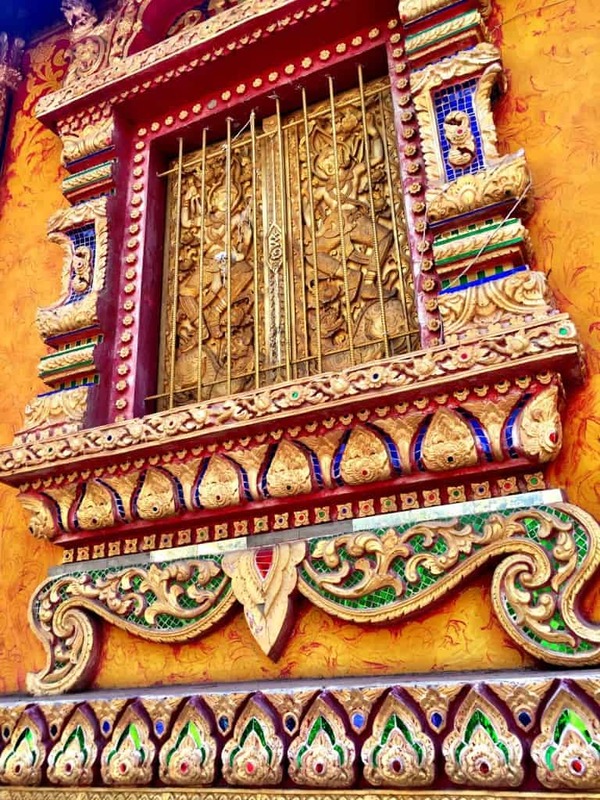 The detail in the temples always looks so pretty–can’t believe how intricate it is! I’ve always wanted to check out Loy Krathong, love the photo from the parade! Hi Jenna – Yes, it was a really fortunate find. You’d love it. This is super interesting and i am going to CM soon so will make sure to stop by. You have opened my eyes to something I had not even heard off despite living in Asia for a long time, thanks! HI Mar – Make sure you check it out. Not far at all from Chiang Mai proper, but a completely different world. So much history, and so much beauty! Looks like it’s definitely worth visiting. Your pictures are great, by the way! Staying in the lost city sounds like the best of both worlds. Although Greg and I enjoy witnessing the madness of a historic celebration, we prefer not to stay in the midst of it. Staying just a tuk-tuk ride away would be the perfect compromise. 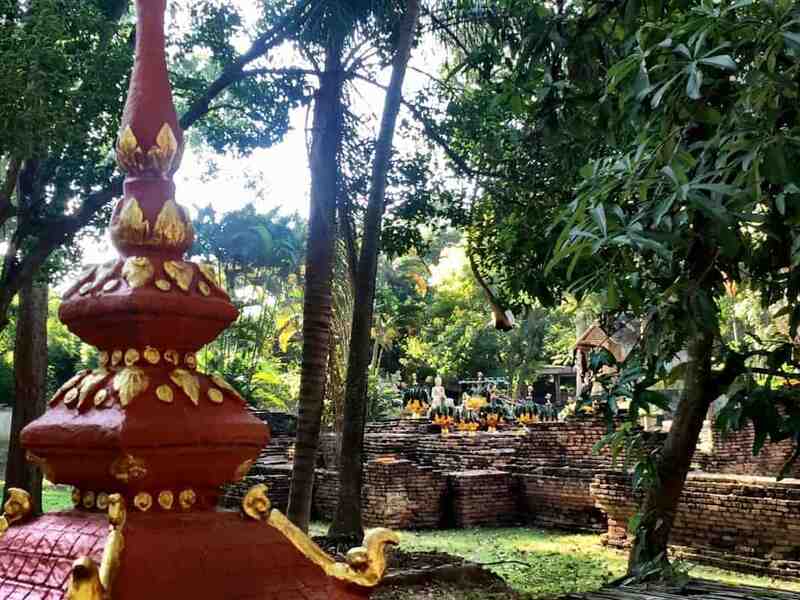 The “lost city” of Wiang Kum Kam looks magical and I can see why you added extra days to your time there. 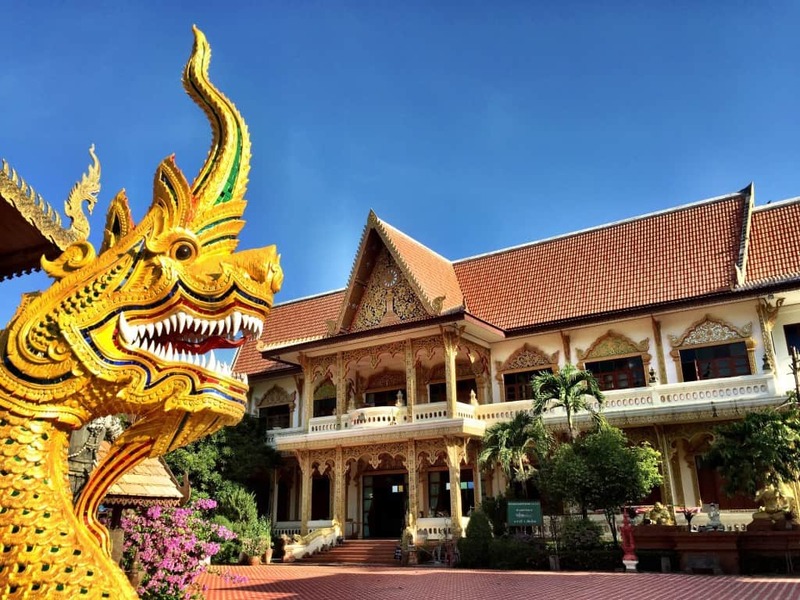 We too have talked often about a visit to Thailand but our dream to visit there has faded over the years as we’ve heard more and more about the crush of people in Bangkok, the overflow of expats in Chiang Mai and the wild, extreme party scene which is definitely not for us. 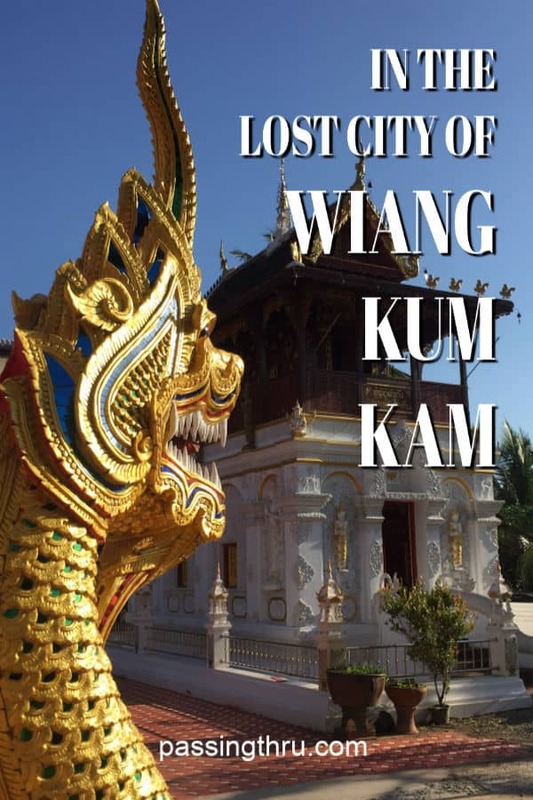 However your descriptions of Wiang Kum Kam have me thinking that straying from the beaten path would give us a fabulous travel experience and I’d love to get to the lost city before it gets found! Seems you had a really quite good tour at Northern Thailand, ultimately happiness is what we look for. Great to hear about something other than Chiang Mai. 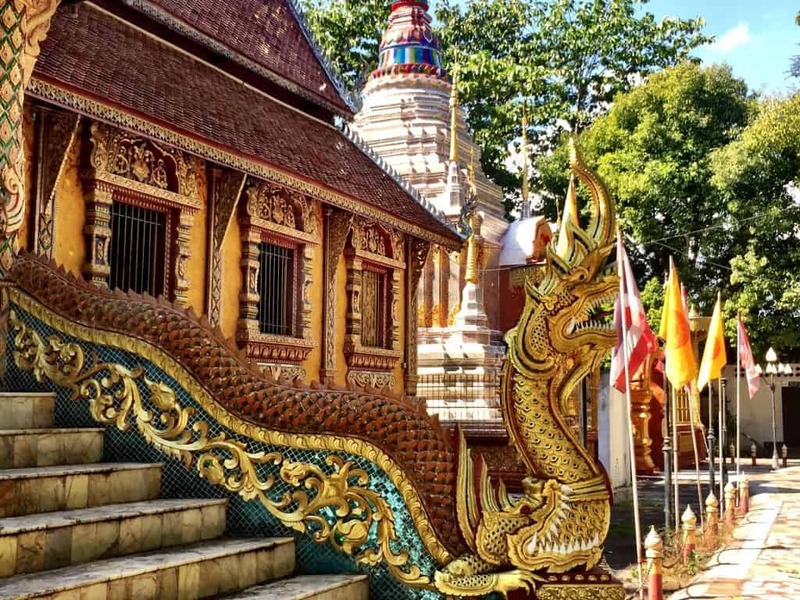 Hi Jan – We love Bangkok and would enjoy staying there any old time, but you’re right, Northern Thailand is one of a kind. Hi Tuk – Glad you enjoyed it. Thanks!